Getting the right dog is a welcome additon to any household. A faithful companion who is always pleased to see you and offers unconditional love. It is a wonderful thing to come home to a house that is never empty and they can also provide the motivation to take more exercise which you might have been putting off ! But on the other hand getting a dog that is not suited to your lifestyle or is badly bred could lead to heartache. With this in mind we have put together some information which I hope will help you to make the right decision when looking to bring a puppy into your life, as I understand that this is a very major decision not only for you, but for the puppy you hope to get. Should I have A Puppy? Having a puppy in your home will be like having a new born baby but more destructive. The time and effort you put into your puppy in the first year of their life will pay dividends for the rest of their life. So you must really ask yourself "Am I in the right place and time in my life to be able to take on the responsibility of a puppy?" Your puppy will probably cry for a couple of nights when you first have them, accidentally wee and poo on your floors and chew most anything if left unsupervised, and it will be your job to shape this little bundle into a house-trained, mannered, well socialized and rounded individual. This means that you need time, as all these things need to be learnt by good consistent guidance. At Poundlane we will have done our best to give the puppy a good start and will help with advice and support when needed. If you think you are in the right place and time for a puppy in your life, then be prepared for a bit of hard work, but the payback of a faithful loving friend will soon make you forget your slippers they chewed up or the nice stain they made on your best rug . A good natured puppy can be ruined in a couple days, as when good natured they will still require good nurture, so please really think carefully and do the research before proceeding with bringing a puppy into your home. Which type of puppy is right for you? This blog post Dog Breeds - 8 Things to Avoid When Choosing Your Puppy written by gundog trainer and author, Pippa Mattinson on 'The Happy Puppy' website is a must to read before getting a puppy. Where To Get Your Puppy? You should always see a puppy with its Mother in the place where the puppy was bred. Ideally you should see the Father too, or at least a photo of him. If the breeder cannot show you the Mother and interacting with her pups, you should be suspicious. 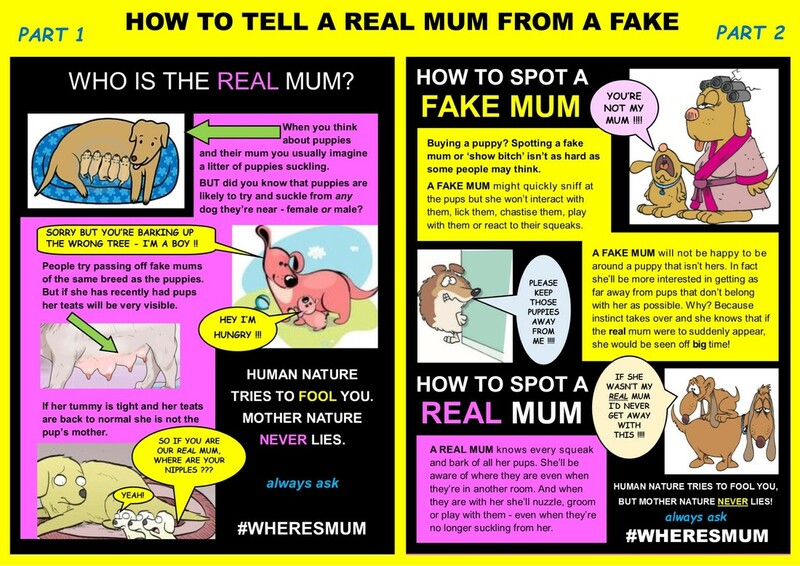 ​Please read my blog post Did you really see the mother? for how to tell if you see a mother, if it is actually the mother of your puppy. If you have concerns about the breeder you visit or the way your puppy has been sold, contact Citizens Advice who will be able to give you advice on who to report your concerns too. It won't be easy, but please take the time to watch the video below to learn about the dark side of puppy farming in the UK and help to stop puppy farming!